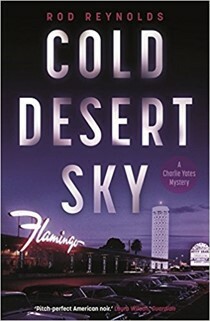 After Black Night Falling’s Arkansas setting, journalist Charlie Yates and wife Lizzie are back in Los Angeles, with Yates working at the Pacific Journal again. Charlie is chasing a story about two missing starlets and has set up a meeting with an informant, only to be bundled into a car. He’s brought before mobster Benjamin ‘Bugsy’ Siegel, who holds him to account for what happened in Hot Springs. A beating and an ultimatum leaves Charlie in no doubt that he’s in a whole heap of trouble and that Siegel would have no compunction in killing him, and his wife. His way out of this mess, is to shakedown targets that the gangster gives him. But, when Charlie tells the first mark to run, the poor schmuck is found dead and Charlie starts to fully understand how out of his depth he is. When a call from another journalist lures him to Las Vegas, he’s even closer to Siegel and the monolith called The Flamingo that he’s building. He’s being pushed by the mob from one side and the Fed’s from the other, but is determined to find out what happened to the missing starlets and to bring Siegel to his knees. In Rod Reynold’s prose, you can sense the influences of Hammett, Chandler and Ellroy. But, this is not a simple ‘go through the motions’ imitation. The author creates a believable and multi-layered work, with spitting and fizzing dialogue, that seamlessly weaves his story into actual events. Whilst Charlie Yates is a battered knight-errant, his white charger is dusty and second-hand armour old and rusty, but nothing is going to stop him from taking his righteous path. Come along for the ride, it’s a wild one.